These Potato Prosciutto Waffles are courtesy of In Sock Monkey Slippers as part of the U.S. Potato Board’s Potato Lovers Club program. These Potato Prosciutto Waffles are excitingly delicious filled with crispy prosciutto and flavorful Parmesan cheese, and did we mention, a fabulous way to used leftover mashed potatoes. Line a baking sheet with parchment paper and evenly lay prosciutto on paper. Bake for 10 to 15 minutes until prosciutto is crispy. Remove from oven and allow to cool. Peel and cube potatoes. Place in a pot of salted water and bring to a boil over high heat. Once boiling, reduce heat to a rapid simmer and simmer until potatoes are fork tender, about 10 minutes. Strain potatoes from water and transfer to a large bowl. Mash potatoes with a fork or potato masher. To the potatoes, add milk, butter, eggs, cheese and thyme. Stir to combine. In a separate bowl, combine flour, baking powder, salt and pepper. Crumble the crisp prosciutto and fold into the batter. Preheat a waffle iron. If your waffle iron requires, grease with cooking oil spray. Spoon batter (about 1 cup) onto the waffle iron and cook according to your iron’s instructions until waffles are golden, about 4 minutes. 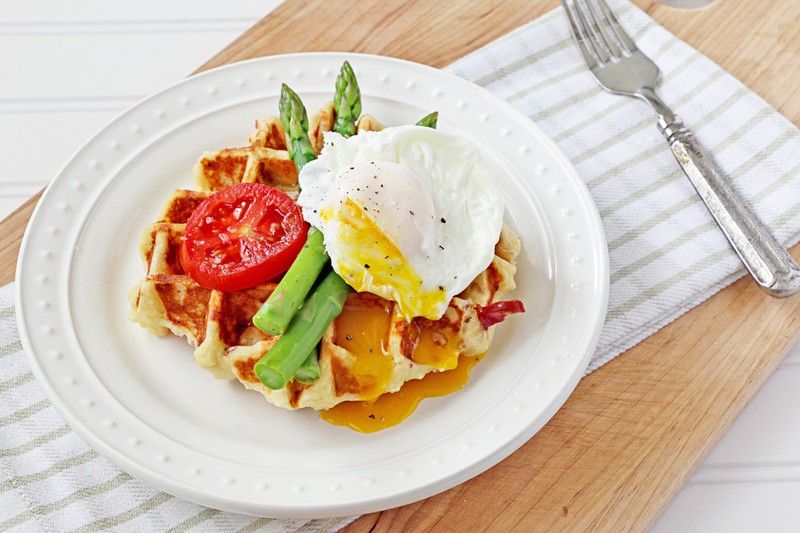 Keep waffles warm in a 200°F oven until all waffles are cooked and you are ready to serve..